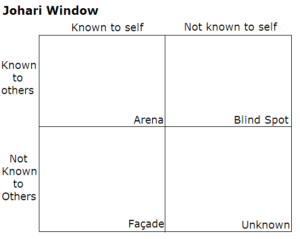 In the Johari Window exercise, participants pick words from a list of adjectives that they feel describe their personality. Other folks who know them then get to pick an equal number adjectives from the same list to describe them. As you can see by the way the grid is laid out, these qualities are given different names depending on who identified them. A person’s “blind spot” in this exercise is predictably made up of adjectives that others selected but that they did not. Some of the most interesting self-insights can come from this quadrant. And the final quadrant is called “unknown.” The adjectives that no one selected go here. While it could mean that the person doesn’t possess those qualities, that’s not necessarily the case. It’s also possible that they have those qualities but they’re both hidden to the person and those who know them. Whew, that’s a lot. But then again, it’s helpful to have some breadth in order to really dig into people’s personalities. 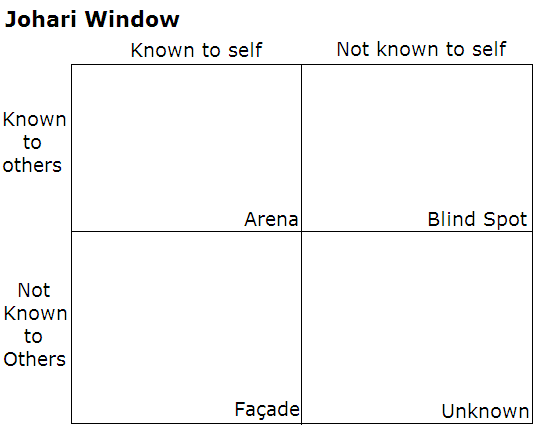 If you’re interested in making your own Johari Window, thankfully it’s pretty easy. There’s even a convenient way to do it online (here, click this link). You can select your qualities under a name of your choosing, and then you can send it to your friends and/or partners with your own unique link by posting it on social media or directly (texting, emailing, etc. ), and they can select qualities for you — and set up one of their own (that you can also complete). My friends group did this a while back, and it was a lot of fun… and yielded a lot of interesting information.